Driver originally formed in the late 80s from the ashes of M.A.R.S. (A "supergroup" consisting of guitarist Tony MacAlpine, drummer Tommy Aldridge, singer Rob Rock and bassist Rudy Sarzo), and released a 5 song EP before disappearing. In 2009 the band was reformed and released "Sons of thunder", their debut album which consisted of re-recorded versions of the 5 songs from the EP plus 7 new songs. Now they are releasing their second album which once again is a mixture of new material and old demos that have been re-recorded. 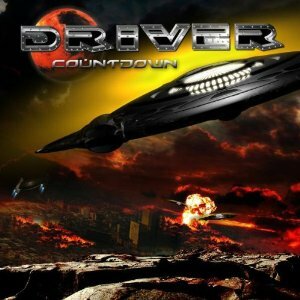 "Countdown" starts off great - hard and heavy metal, and then the vocals kick in, and before long its a melodic rock song. Some of the best guitar work is found in "Babylon", which seems a shame as its a European bonus track, so fans in the rest of the world will miss out on this, and its a great track. There is a definite 80s feel to this album. Overall I'd say its a good album, rather than a great album. I think for me the problem is that the album doesnt seem to know what it's supposed to me - is it a heavy metal album or is it an AOR/melodic rock album. You've got some great heavy metal style guitar riffs and some songs that could work well as heavy metal, but coupled with AOR vocals and with the heaviness toned down it just seems to lack the punch it needs. As a melodic rock album its good, but personally I'd like to hear it with different vocals and without the heaviness dialled down - then we could be looking at a great album. "Countdown" will be released on 28th May via Metal Heaven.